FS-UAE is an Amiga emulator for Windows, Linux and Mac OS Xbased on UAE/WinUAE, with a focus on emulating games, though it also emulates high-end Amigas. Features include emulation of Amiga 500, 500+, 600, 1000, 1200, 4000, CD32 and CDTV, perfectly smooth scrolling on 50Hz displays, support for floppy images in ADF and IPF formats, CD-ROM images in ISO or BIN/CUE format and mounting folders on your computer as Amiga hard drives. 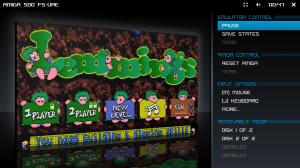 The emulator uses the latest Amiga emulation code from the WinUAE project and requires a moderately fast computer with accelerated graphics (OpenGL) to work. A game pad or joystick is recommended, but not required (FS-UAE can emulate a joystick using the cursor keys and right ctrl/alt keys). FS-UAE integrates the most accurate Amiga emulation code available from the WinUAE project. FS-UAE is fully controllable with a gamepad, with an on-screen GUI, which means that you can easily swap floppies and load save states with your gamepad. In addition to being great on your personal computer, FS-UAE is also well suited to be started from an emulator frontend running on a HTPC. The screenshot shows the on-screen GUI. From here, you can (among other things) change input options and insert floppy images. The 3D effect is only active while in menu mode, of course.When playing the game, the game occupies the entire window. FS-UAE includes an easy-to-use graphical configuration program which allows you to enjoy FS-UAE and Amiga emulation without writing configuration files. Using this program is optional, and if you are a minimalist, you can instead use just FS-UAE alone. FS-UAE recognizes and supports many joysticks and gamepads out of the box without any configuration, with correct setup both for Amiga and CD32. Support for additional models can be configured with the joystick configuration tool bundled with FS-UAE Launcher. FS-UAE can synchronize to your 50 Hz monitor (for PAL Amiga emulation) or 60 Hz monitor (for NTSC Amiga emulation). When the video is synchronized, you get perfect scrolling in games without the micro-stuttering which will otherwise occur. FS-UAE can synchronize with your display on all supported operating systems. FS-UAE uses OpenGL for video output, and there are many options to tweak how the Amiga display is shown on your screen. By default, the Amiga display stretches to fill your monitor, but you can enable aspect correction, zoom in or out, enable OpenGL shaders for advanced effects, and use visual themes. 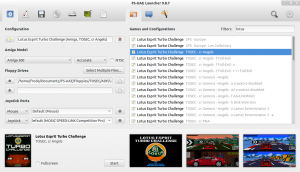 FS-UAE Launcher integrates with the Open Amiga Game Database (OAGD). This allows FS-UAE to scan your Amiga game files and automatically create game entries for recognized ADF, IPF and WHDLoad games. The games will be automatically configured, and FS-UAE Launcher will also download covers and screenshots from OAGD.net. FS-UAE supports emulating an Amiga 4000 with an CPU as fast as your system can emulate it. Picasso96 drivers can be used with the built-in UAEgfx card to display Workbench in high resolutions and with up to 16.7 million colors, and the built-in bsdsocket.library means that the Amiga will have access to the Internet. FS-UAE works on Windows, Linux, Mac OS X, FreeBSD and OpenBSD. Apart from a few small differences, the feature set is the same on all platforms. A unique feature is support for cross-platform online play. 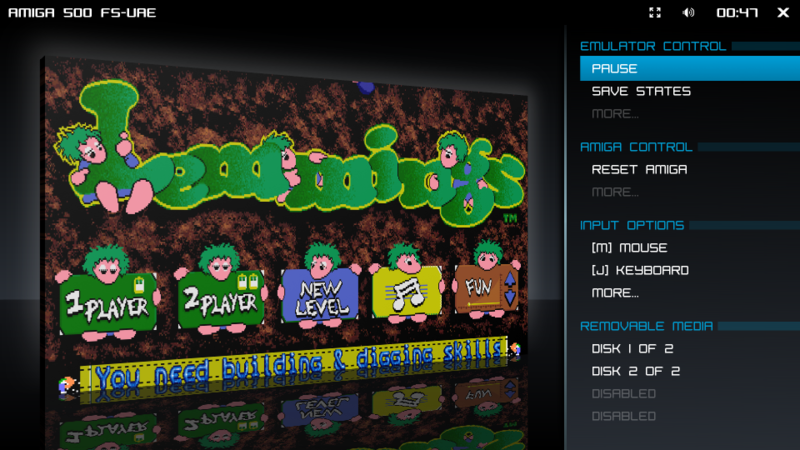 You can now play Amiga games against (or with) friends over the Internet. The online play feature is designed in a way which avoids de-synchronization issues. 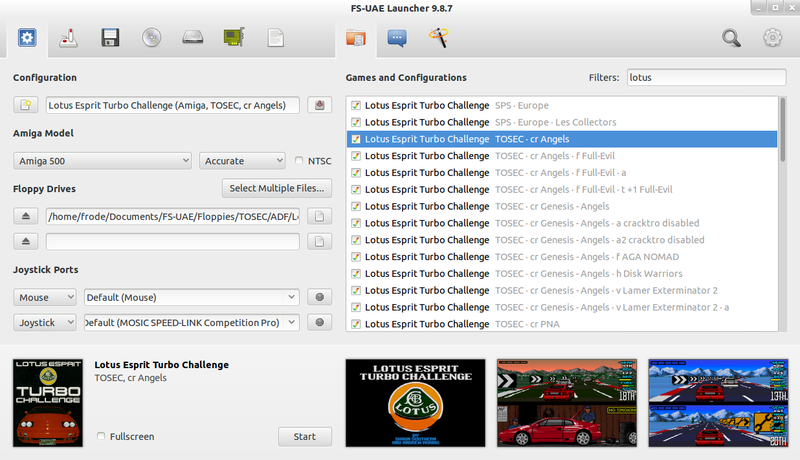 Both FS-UAE and FS-UAE Launcher are translated into several languages. The currently supported languages are French, German, Italian, Norwegian (Bokmål), Polish, and Serbian. -In addition to English, which is the default language. When you take a screenshot in FS-UAE, by default you get three different images saved to your screenshots folder. 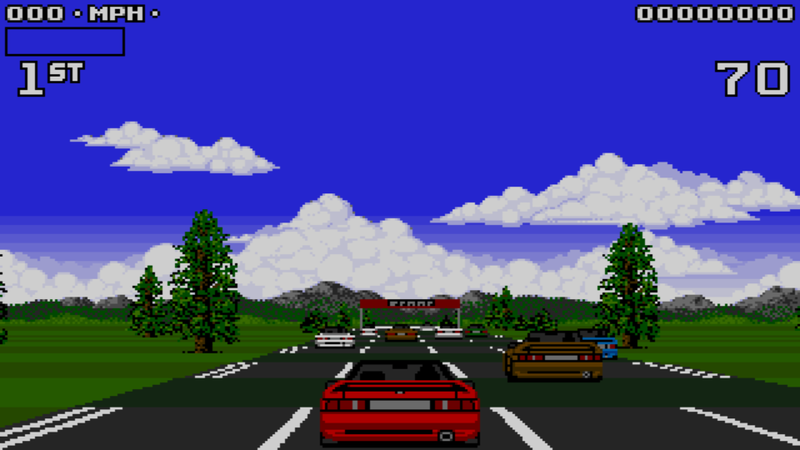 One is the real screenshot (the scaled graphics you see on screen), but FS-UAE also saves a 1:1 pixel image of the entire Amiga video output, and also an 1:1 image which is cropped to what you see on screen. If you have archived WHDLoad games in .zip or .lha, you can launch many of them by simply adding the archive as a hard drive. FS-UAE Launcher will recognize that it is a WHDLoad game, and automatically configure an “internal hard drive” to boot and launch the game for you. FS-UAE is free software and is licensed under GPLv2 (other parts / dependendent libraries are licensed under LGPL or other open source licenses). Source code is available on the download page, and parts of the FS-UAE project (including the emulator itself) have public git repositories. A great deal of documentation about how to use and configure FS-UAE is available on fs-uae.net. There is a support forum for FS-UAE on the English Amiga Board with many active registered users. If you are stuck, you’ll almost certainly get an answer to your questions there. You can also leave comments on fs-uae.net is you rather want that. I’d almost given up on Amiga emulation on my laptop. Despite it being more than capable of running the latest titles, for some reason all the later versions of WinUAE just were not happy. Sound buffer issues and crawling frame-rate made me think I was never going to get to play Turrican 2 again, but FS-UAE is absolutely fantastic! Great performance in windowed mode or fullscreen, you have revived my love of the amazing Amiga! Thank you! Go to power options, advance edit and change CPU power to higher number while connected to power source.